Reflections and Ruminations: When having a foretaste of seeing Christ face to face is a privilege beyond words. When having a foretaste of seeing Christ face to face is a privilege beyond words. I had the most exhilarating few days of my life right after Christmas (a week ago), when I welcomed the donor of my matching stem cells to Singapore. Coming all the way from Chicago, Peter Mui came to visit me and my family together with his wife, Lily, and their two lovely children Ethan and Claire. The many interviews that we had on national television, radio and the local press gave fresh reasons for me be struck with awe and gratitude just how amazingly God had orchestrated such a miracle, to bring me a new lease of life through another human being with a most generous heart. The Press tried to convey the waves of gratitude coming from me, but I suppose publications like these are wary of coming across as overtly giving in to the spiritual life, especially in a multi-religious place like Singapore. My transplant took place one and a half years ago. But I can never forget nor put aside that the reboot that I was given in life came from an act of selflessness and graciousness. And because this ‘new’ me has been sustaining me from within, each time I go into prayer, gratitude fills me. I had an insight recently in prayer when I was before the Lord in the Blessed Sacrament. I formulated a litany of how my life had changed because of Christ’s incredible saving act for a sinner and a broken person like myself. And with Christ in mind, these phrases articulated my depth of gratitude for the gift of salvation. I could never have saved myself without your help. You stepped forward when nobody was able to. My life is forever changed because of your selfless act. Each day of my existence is possible because of your life within me. In my darkest hour of need, you were my saving hope. The day I got you into my life was the day that I lived forever a changed person. There is no way that I could have possibly deserved or merited what you have done in my life. You will be always with me no matter what I do, until the end of my life. If you never did what you did, my death would have been certain. No amount of gratitude can fully express my heartfelt thanks for the way you have saved my life. Knowing just how urgently I needed you in my life gives me reason to be filled with gratitude for what you have done to give me a newness in life. It was after I had meditated on each of these statements of truth, that I realized one other thing – that each of these same statements can just as easily and accurately be applied to my stem cell donor, Peter Mui. I consider myself so privileged to be able to have this earthly experience of being at the mercy of someone’s selflessness because it gives me a very real perspective in appreciating Christ and his saving work in a very real and intimate way. Without my illness, I would not have gone this deep and this expressive of my gratitude for Christ’s work of salvation for our souls. This illness of mine was certainly a blessing, though I am sure that not very many would readily agree with me. The raw, painful and tumultuous moments of our earthly life are often the cause of our complaints and rants to God in prayer. But little do we realise that these are also the very raw material through which God enters into our lives as well. These are the cracks in our darkened souls which let in that shard of precious light that lightens the darkness and gives us new reason to hope and believe anew. I do hope that my reflections on life and faith give my readers that necessary shot in the arm that all of us can do with from time to time, especially when the going isn’t all that smooth. I probably will come back to read this from time to time, because this message has a very strong reminder that I will one day with great anticipation see my own eternal savior face to face. I am just one of the very few who have had the privilege and honour of seeing the earthly version of Christ and to be able to share this joy with the many people in my life. Once again, thank you for sharing your reflection with us. By merely reading your insight, I can only imagine what an intimate moment of prayer it must have been. Yes, all events in our lives (good and not so good) only have one purpose – to bring us closer to God, to make us feel His Love! This year’s Christmas has also been a special one for me as I made a retreat at a long-anticipated venue, where I gained much insight to the gospel of the greatest commandment. (Mark 12:34) - Sometimes, when we intelligently know the correct answers, it is exactly where we missed the mark, and only at best – “not far from the kingdom of God”. Many a times, we get carried away “loving God & others” our human way, our will, our mind and heart that we forgot to ask God, how He wants us to love Him. What is His Will for us? Do we truly surrender to His Will docilely, many a times beyond our intellect? We who are at IHM were also blessed for the opportunity to meet with your stem cell donor – Peter & his family (with equally beautiful generous hearts), and to sincerely express our thanks for his act. For me, more than saving the life of our beloved priest, – this unwavering decision (12 years later) of saving someone’s life is a courageous act of surrendering to God’s will, in God’s time and not on our own agenda. As you said in your homily, only a family truly having Christ as their center will do what every Christian ought to do. 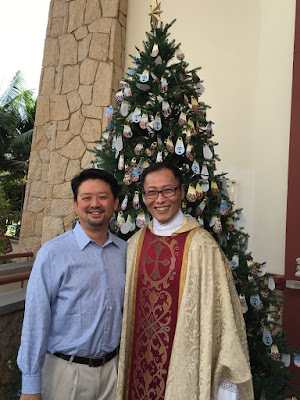 But I believe more importantly, it’s has a “hidden” awe-inspiring sign, now for all to see – All things happen in God’s time, in this case, on your ordination day – your kindred ‘blood’ brother was planted for you. Wishing all a Blessed and Happy New Year, filled with God’s graces and surrounded in HIS LOVE. And I thought to myself that, that’s what Love is about ( if it’s to be genuine)............you have to give a ‘piece’of yourself...........it has to be painful-maybe, it has to be messy and inconvenient- maybe,.................but unless and until one is willing to part with a part of oneself – be it one’s comfort, convenience or ego-centeredness or a real, physical part of oneself like donating one’s blood or one’s stem-cells to a total stranger, it cannot be a real “giving.” And of course if you cannot love in this selfless way then you cannot expect to claim the privilege to have a ‘foretaste of seeing Christ face to face’ because you won’t understand or recognize what or rather who Love is and what He has done. How then dare you claim the grace to ‘see him face to face”? Happy New Year! I haven't been keeping up with, or posting much on your blog this past few months, but I do read snippets of it here and there. Your experience of getting a reboot in life is truly inspiring. It is in the darkest times of our life that we find God sometimes when we least expect it. I am so encouraged by the act of selflessness and graciousness and it is my new year resolution to try harder with my faith and to appreciate the little acts of love that we often overlook. We start by getting it wrong, but God doesn't.